Live Digital Mixing Has Never Been Easier! 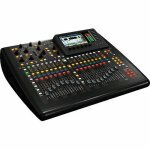 The Behringer X32 Compact digital mixer boasts massive I/O for its compact size. Fitted with 16 great-sounding programmable mic preamps, eight XLR outputs plus six additional line I/O, two headphone connectors, and a talkback section with an integrated or external mic, the X32 Compact lets you do sizable shows without the fear of running out of I/O. A built-in expansion port for audio interface cards or digital networking bridges expands the X32 Compact's functionality as needed. Got a really big show coming up? The X32 Compact has a ready 48-channel digital snake via two AES50 ports that feature Klark Teknik's SuperMAC networking capability for ultra-low jitter and latency. For the design of X32 Compact's programmable preamps, Behringer worked with sister companies Midas and Klark Teknik to develop programmable, studio-grade mic preamps that deliver enhanced dynamic range, superior common mode rejection, and vanishingly low harmonic distortion (THD). These preamps sound amazing! 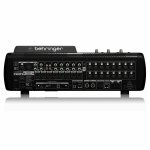 The Behringer X32 Compact digital mixer sports an onboard virtual FX Rack that gives you access to eight true-stereo (16 mono) multi-effects processors including delay, chorus, and dynamics. It can also run four studio-quality stereo reverbs together with eight channels of 31-band graphic EQ. Say goodbye to bulky, expensive outboard hardware! 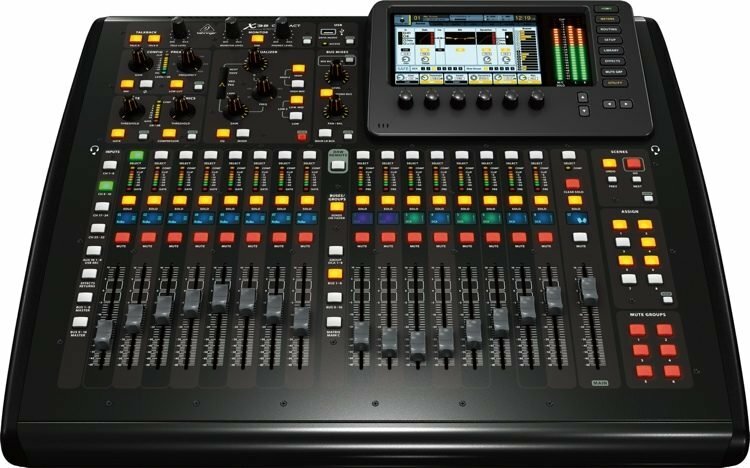 With Behringer's X32 Compact digital mixer, you can assign signals to eight DCA (Digitally Controlled Amplifier) groups, with simultaneous group level control via dedicated 100mm motorized faders. The X32 Compact has a talkback section (with a built-in mic) that lets you communicate with the artists. The X32 Compact's robust scene management lets you take snapshots of your mixes that you can recall later. You can even save them to a USB stick! What's more, there's a high-resolution 7" daylight-viewable color TFT display for easy viewing of your workflow components and parameters. With v3, the Behringer X32 Compact digital mixer is more powerful than ever. Auto Mix enables Dugan-style gain sharing, providing increased gain to your main speakers while ducking open mics. This yields a better signal-to-noise ratio without any gating artifacts. Complete X-Touch integration allows direct control of volume, pan, EQ, FX, and more over Ethernet. Set up a full crossover without using a matrix mix. Reverse polarity on your outputs for easy speaker alignment. The X32-Edit app has been completely redesigned, with a new interface, full-screen capabilities, floating windows, configurable fader layers, and more.